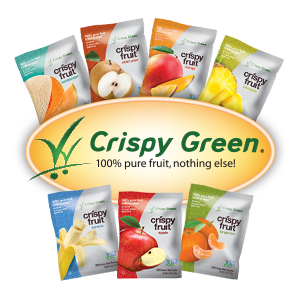 Providing nutritious and delicious snacks to consumers of all ages is what Crispy Green is all about. Each bag of Crispy Fruit contains a single ingredient, Fruit! The experience, taste and quality of every bite is backed by our 100% satisfaction guarantee that includes our no-questions-asked, hassle-free return policy. Simply put, our Crispy Fruit is the perfect way to satisfy your snack cravings while adding more fruit to your diet - all without additives or preservatives. Our sophisticated freeze-drying process removes the water from fresh fruit, leaving behind the fruit's true essence in a light and crispy texture. Crispy Fruit is the perfect snack-time treat right out of the bag so you can enjoy healthy, real fruit anytime! 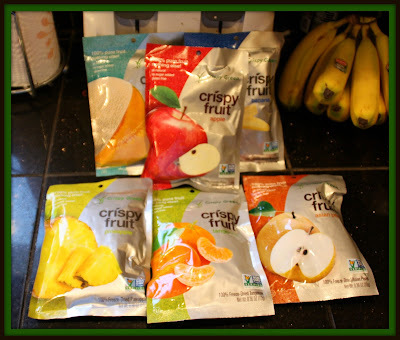 So, for this review I was sent an assortment of Crispy Fruit to try. The varieties range from everything like apples and mangoes, to Asian pears and Tangerines. 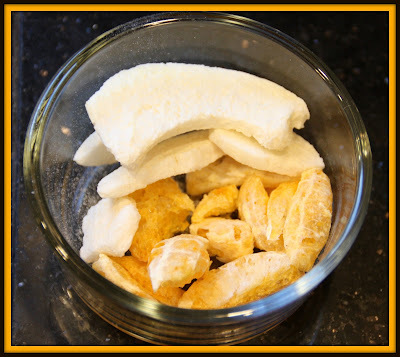 I was really surprised at what could be freeze dried...I had no idea that tangerines could be crispy!! Each bag of Crispy Fruit contains pieces of freeze dried fruit and each bite is loaded with a satisfying crunch and bursts with flavor. The bags are also the perfect size for on the go snacking or for tossing in your child's lunch box. The only thing that would be better would be a resealable bag...that would be awesome! This fruit looks like it was picked fresh and dried immediately...the colors are still vibrant in each piece and the flavor is wonderful. I think my favorite fruit was the pineapple. I love anything pineapple and enjoying it dried was sooo fun! When I offered this Crispy Fruit to my children, they were apprehensive at first but once they saw me eating it, they dove right in. Only one of my children didn't like them but the rest thought they were wonderful! I love giving these to my 19 month old, she really loves them as a snack before meal times. And, feeding my children snacks that I feel good about is soooo amazing. There are seven flavors of Crispy Fruit for you to choose from: Apples, Mangoes, Asian Pears, Bananas, Cantaloupes, Pineapples and Tangerines. That is an awesome variety and will be sure to please any fruit-lover's palate. You can purchase Crispy Fruit at retail food chain stores across the country...to find a Crispy Fruit retailer near you, visit their store locator page and click on the state in which you live. You can also purchase online as well. 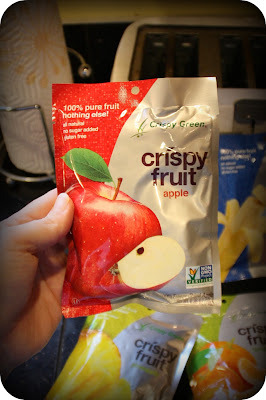 So, my family has thoroughly enjoyed trying out Crispy Fruit and would definitely recommend them to you as well!! Be sure to visit them online as well as on their Facebook page and become acquainted with fresh fruits...dried to perfection and packed with an amazing crunch! !